Sugary cereal does not have to be your go-to breakfast in the morning just because it’s easy. I recently shared the idea of a breakFEAST easy pancake bar to add a little fun in your mornings, and all you busy moms out there will be excited to hear that these recipes are even easier. I am all about easy in the morning! 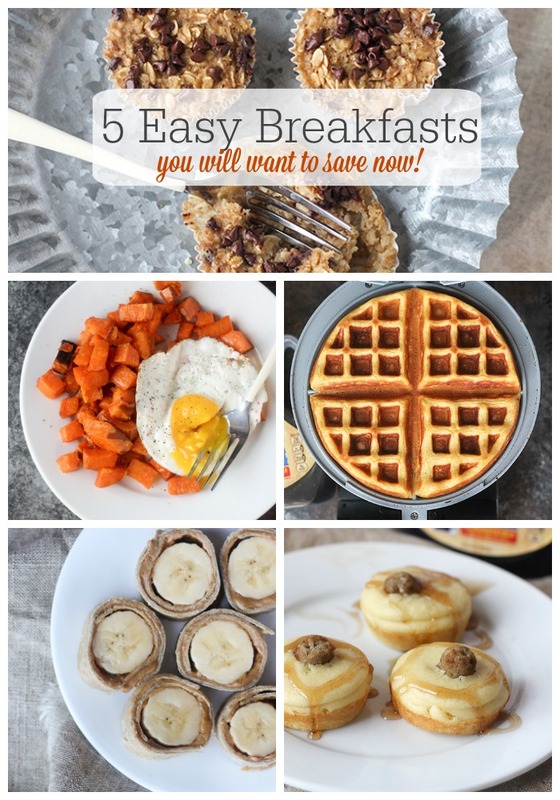 (Especially on school days) Here are FIVE simple and easy go-to breakfast recipes sponsored by Hungry Jack. The great things about these little bites is that you can pre-make them and keep them in the fridge! Simply preheat your oven to 350 degrees and prepare Hungry Jack pancake batter according to directions. Divide the batter between muffin tins and bake for 5 minutes. Take the pancakes out and add a cooked sausage link. Return to the oven and bake for an additional 5-10 minutes or until the pancakes are cooked through. 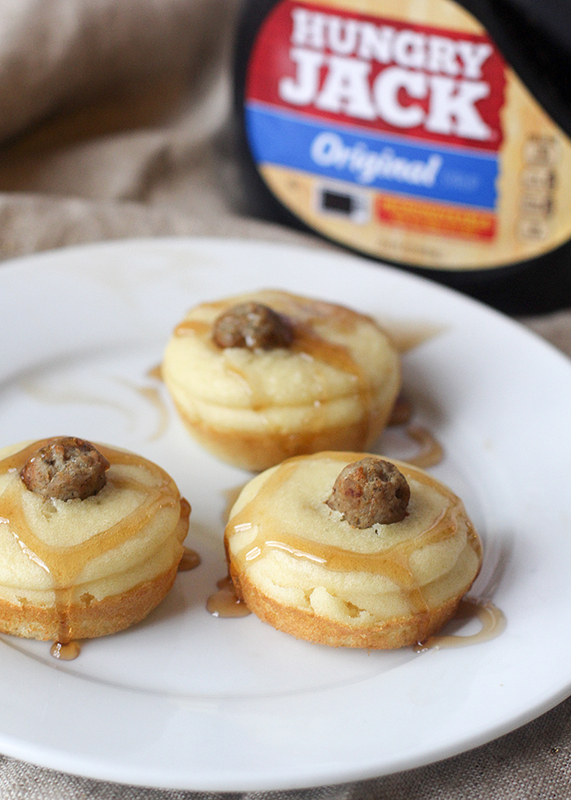 Drizzle with Hungry Jack’s microwaveable syrup. 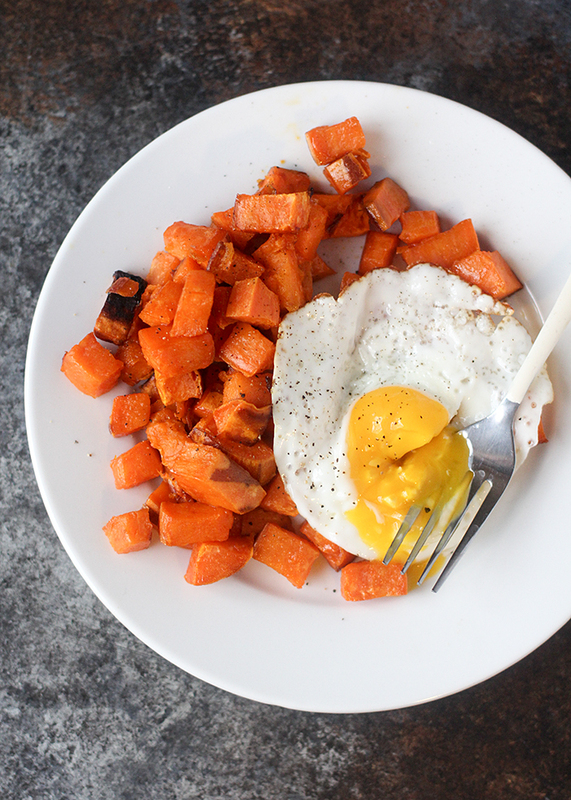 Sweet potatoes are one of my favorite foods and they are perfect for breakfast, lunch and dinner. Preheat your oven to 425 degrees, dice two large sweet potatoes and toss them with 1 Tbls Olive oil and 1 Tbls Hungry Jack Original Syrup. Sprinkle with a little salt and pepper and roast for about 30 minutes or until golden brown. 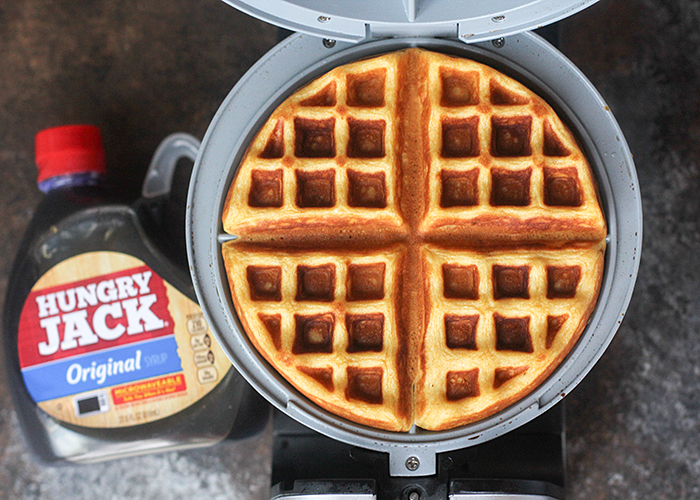 Waffles are so easy to make that you don’t need to buy the pre-made freezer kind. You can prepare your own and keep them in the fridge or freezer. When it’s breakfast, simply pop them in the oven or toaster! The possibilities are endless with waffles. I added 1/2 cup pumpkin puree to this Hungry Jack Original batter. You could make Hungry Jack Funfetti Waffles and top with whipped cream or even Hungry Jack Multigrain and top with fresh fruit. We used this Oster Double Flip Waffle Maker which made clean-up extremely easy. No hard to clean waffle maker! Score! 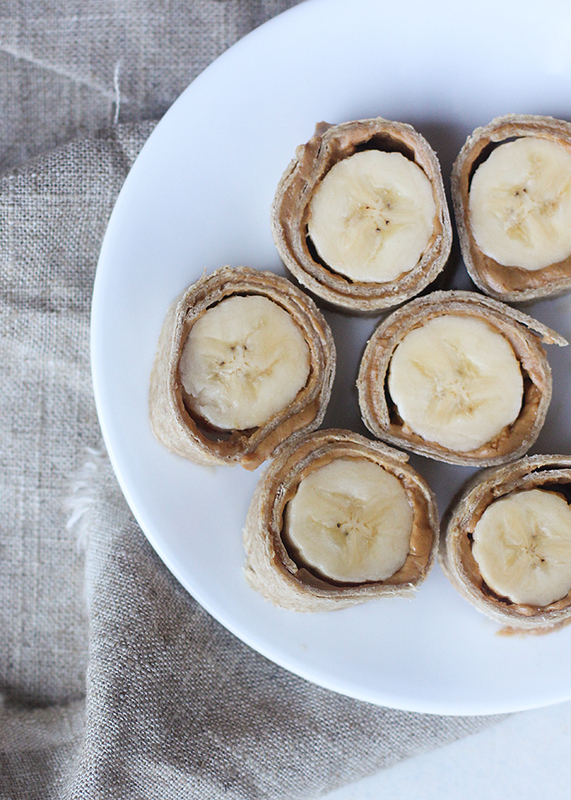 These banana wraps are almost too easy to share, but they have become a staple snack and quick breakfast in our house. The flavor combination is typically banana + peanut butter + honey, but a drizzle of hot maple syrup is what makes these wraps special. All you need is a whole wheat tortilla, your choice of nut butter, a whole banana and Hungry Jack syrup in the new, easy microwable bottle. I have tried baked oatmeal before, but those recipes usually turn out more like muffins. If you’re an oatmeal-lover, you will love this oatmeal to-go recipe. Preheat your oven to 350 degrees and mix the ingredients together. 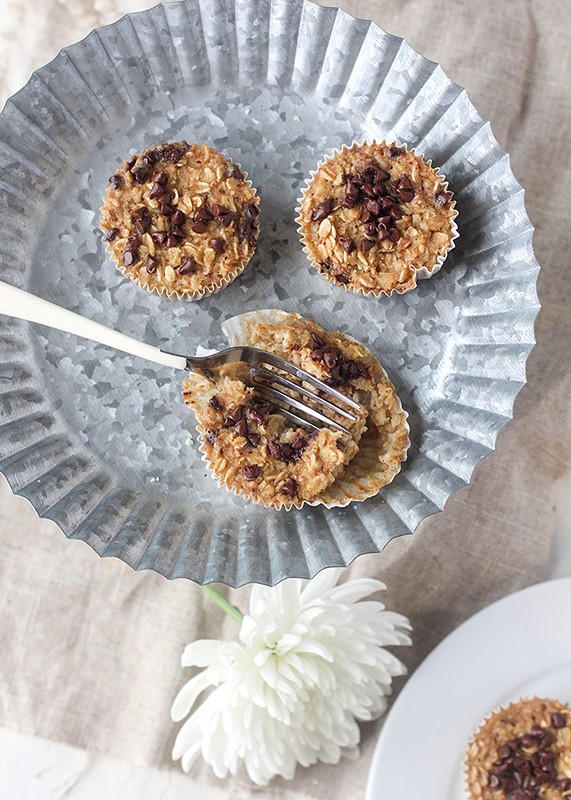 Line a muffin tin with liners and fill each 3/4 full with oatmeal mix. Bake for 15-20 minutes. Let cool. Makes about 20 muffin tins.